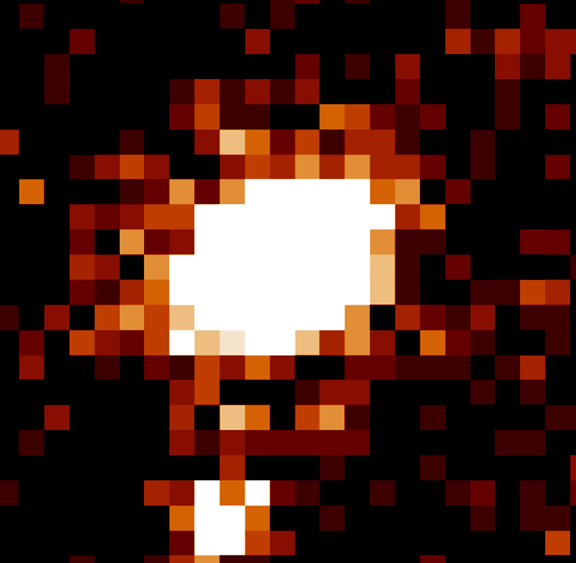 A Chandra image of NGC 720 shows a galaxy enveloped in a slightly flattened, or ellipsoidal cloud of hot gas that has an orientation different from that of the optical image of the galaxy. The flattening is too large to be explained by theories in which stars and gas are assumed to contain most of the mass in the galaxy. According to the standard theory of gravity, the X-ray producing cloud would need an additional source of gravity - a halo of dark matter - to keep the hot gas from expanding away. The mass of dark matter required would be about five to ten times the mass of the stars in the galaxy. An alternative theory of gravity called MOND, for Modified Newtonian Dynamics, does away with the need for dark matter. However, MOND cannot explain the Chandra observation of NGC 720, which shows that the dark matter halo has a different shape from that of the stars and gas in the galaxy. This implies that dark matter is not just an illusion due to a shortcoming of the standard theory of gravity - it is real. The Chandra data also fit predictions of a cold dark matter model. According to this model, dark matter consists of slowly moving particles which interact with each other and "normal" matter only through gravity. Other dark matter models, such as self-interacting dark matter, and cold molecular dark matter, are not consistent with the observation in that they require a dark matter halo that is too round or too flat, respectively. Coordinates (J2000) RA 01h 53m 0.4s | Dec -13° 44' 18"
References D. Buote et al., 2002 Astrophys. J. 577, 183.